Welcome to February’s newsletter and especially those who have joined this month. Apologies if some of my responses have been a bit slow to individual enquiries during the past few weeks. I’m extraordinarily busy with lots of work going on behind the scenes on a number of important and significant local issues, as well as individual casework matters. I think I’m about up to date now though, so do keep sending me your requests. Wherever I can help I will. As ever there’s lots of news to update you on so straight down to business. If you have any comments, any issue you would like to raise or need help with personal casework please get in touch. 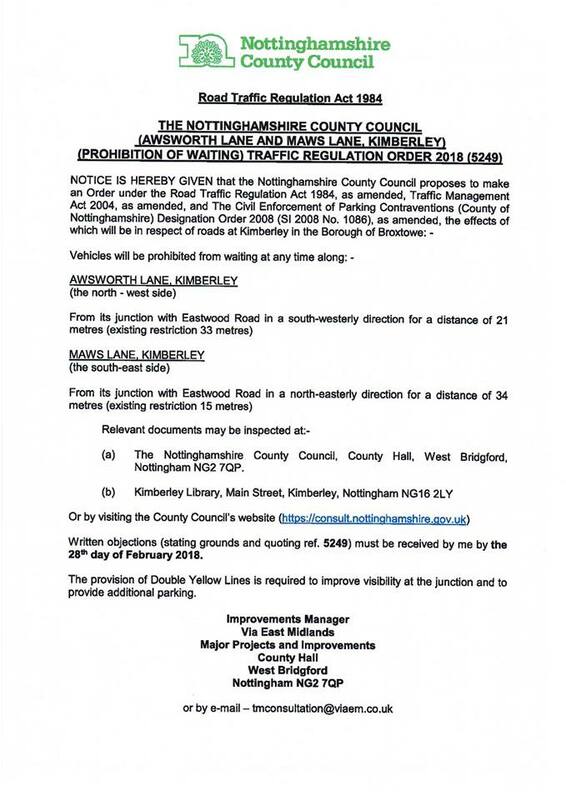 I have received information showing how Nottinghamshire County Council want to make further *improvements* to the Maws Lane/Awsworth Lane junction. A number of residents in and around Maws Lane have been in touch stating how disappointed they are with what the County Council are proposing (which will do nothing to alleviate the ongoing long standing problems in this area). You have until 28 February 2018 to make your views known. These should be sent to tmconsultation@viaem.co.uk (my response is shown below). Please see the following details (dependent upon your internet browser you may need to click on the actual images). I have been passed your letter of 29 January 2018 by Broxtowe Borough Council regarding the above. I would like to take this opportunity to respond and send you an example of one of the comments I have received (below). In my letter of 24 August 2016 (as above and contained within the link above) I stated as follows: “I would be happy to meet up to discuss the work that was undertaken and that I looked forward to some to some imaginative and long term benefits for local people and therefore address long standing traffic problems in this part of Broxtowe”. I regret to say that the offer to meet never materialised, to which I was very disappointed, but not surprised. Furthermore whilst I (eventually) received responses from the County Council, they completely ignored the major issues faced by local residents in Kimberley. I will not repeat these here as I have raised them previously on so many occasions. The County Council insisted on pursuing (in their own words) the cheapest and quickest option with regards to Maws Lane “improvements” of £25,000. I argued consistently that the monies would have been much better spent looking at the longer-term solutions to traffic issues in Kimberley. Whilst I understand the County Council will say that their stance has been vindicated by the Ombudsman regarding Maws Lane £25,000 scheme (this largely related to the validity of the consultation) – the demerits of the scheme alas are now quite clearly emerging. Spending further monies on double yellow lines is going to do nothing to ameliorate the situation for residents in and around Maws Lane who live with daily problems that the County Council continue to ignore. In fact it will only exacerbate matters further. For example please see the email from a local resident that was sent unsolicited to me. Please do not think that this a case of “I told you so”. What I would ask for a further review of the suggestions made by local residents contained in my original consultations to be actively considered. I would (again) make the offer to meet with you and local residents in order to work out together a more constructive and positive way forward. Many thanks for your time and assistance in this matter which is very much appreciated. The Holy Trinity church in Kimberley continues to make a significant contribution towards the well being of local residents within the nearby community. The church is an integral part of everyday life to many hundreds of local people. – replacing the existing church hall with a modern facility created within space inside the present church building which will then serve as both a community facility and church. – the inside of the church will be modernised with new flooring and seating creating an area for community use whilst retaining the main church area and the altar sanctuary for services and worship. – the existing church hall, which is now over 60 years old, is in very poor condition and approaching the point where it is not fit for purpose. The hall however, is a crucial community facility and its loss would have considerable impact on local community users. With this in mind, the proposal is to replace this facility within the existing church building by creating a dual purpose area which can be used for both community activities and church services. Significantly, the new facility will be modern and up to date and include all the essentials for a community area such as toilets, including an accessible toilet, a kitchen, an area for community activities eg: Playgroup, Brownies, Karate, Dog Training, Badminton, Yoga, Dancing and so on together with a place to meet and have tea and coffee. – the proposal also envisages a new entrance area to replace the existing choir vestry and in the church grounds improvements will be made to the surrounding area and also to the car park which will include a revised access from Church Hill. I have received a lot of correspondence recently from residents concerned about ever increasing traffic congestion in around Giltbrook – especially at rush hour times. 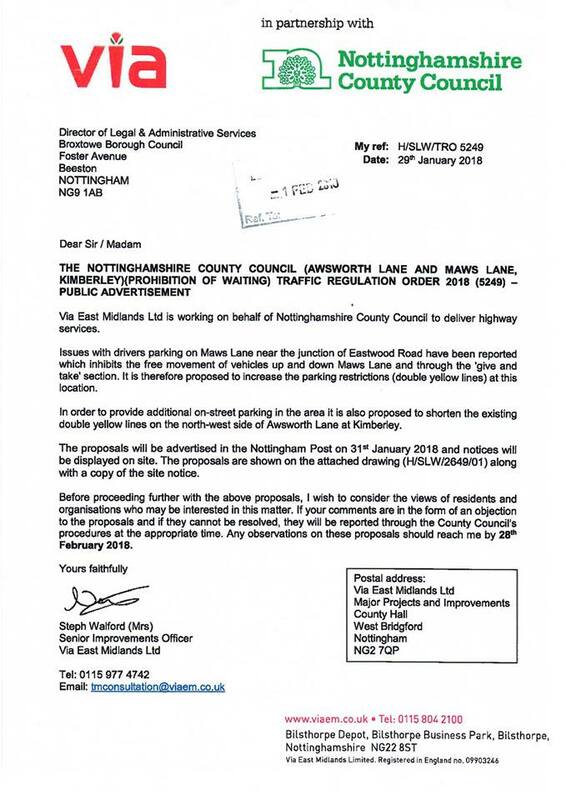 Nottinghamshire County Council have been contacted on many occasions and the latest response I have had this week is shown below. – who has in particular done a lot of work on this, and we have both asked the County Council to see what longer term solutions to the traffic problems can be found. There is a significant amount of traffic that travels towards Awsworth and Ilkeston from the Eastwood direction in the morning peak and does the reverse in the evening peak. In addition in the morning there is also a significant amount of traffic that comes off the A610 and turns right towards Awsworth and Ilkeston (and possibly further afield such as Spondon and Derby). This traffic causes queuing and congestion which affects the approaches to the A610 Roundabout coming from Eastwood and from Awsworth. Drivers are channelled into the offside lane on the approach coming from the Ikea island if they are travelling towards Awsworth or heading onto the A610 towards Langley Mill. The inside lane is for traffic travelling towards the M1 and Nottingham. This lane allocation is due to the relative traffic flows. In the morning the traffic flow heading towards Awsworth is the highest, with Nottingham traffic next highest, then A610 towards Langley Mill. If the lanes were adjusted, there would be more queues and congestion as the 2 largest flows (Awsworth and Nottingham bound) would be in the same lane. 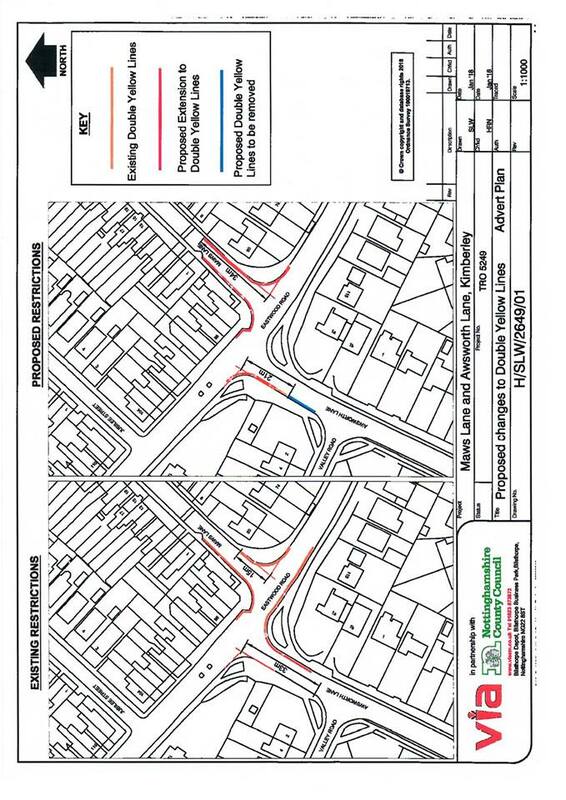 I have made adjustments to the traffic light settings at the A610 / Gin Close Way Junction to reduce the green time that the A610 Off slip receives. I hope this will alleviate some of the congestion, however during peak periods there will still be queues and delays in the area. Following concerns from local residents I have launched a major campaign to try and improve road crossing for pedestrians near Nine Corners in Kimberley. So many people try and cross the road either to get to Kettlebrook Lodge, Holy Trinity Church and of course to then cross back and walk up to Hardy Street and experience many difficulties. Thank you to all who have been in touch thus far, following letters I have delivered. There are some very interesting ideas coming forward and I will go through all of the replies next month with submissions to be made in April to the County Council. I’ll update you when there is more information and publish a summary of all the responses I have received. A big thanks to Kimberley resident and volunteer with 2nd Kimberley Scouts Mr Ellis Tansley who organised a petition of 2250 names demonstrating the clear strength of support for this very popular and well used building, and opposition to any development on its site. At Broxtowe Borough Council full meeting on Wednesday 31 January 2018 this was presented – and it certainly, well shall we say, caused a stir! I am pleased therefore that the strength of opposition to Kettlebrook closing is so strong and that the original closure *suggestions* (as they are now diplomatically referred to) are being dropped. Many of you in Kimberley will be aware of the events that happened on Hardy Street earlier this month. I got lots of messages about this. All of the information I received was sent to the police and I also passed on confidential information that was relayed to me. I mentioned this in January’s newsletter and not surprising there is a been plenty of responses. One of the worst areas I was notified about was the top of Swingate. I visited residents up there last week and duly reported the problems to the County Council. They in turn have said they will carry out some work this week. A major issue is that a lot of work that is done is only of temporary nature and there are deteriorations again soon after, which I have challenged the County Council about. If you have further areas you would like to be looked at please let me know. https://www.broxtowe.gov.uk/news-events/whats-on-where/ – this link contains some interesting local information. I hope to have some more detailed news on developments next month, following work being currently undertaken with a number of strategic partners. Hi my name is Katerina Sykes the proprietor of Pet Walk & Stay home comfort. I am devoted to providing the best possible pet service for you and your pet/s. We often find ourselves in an increasing demanding lifestyle which distracts to carrying out the undivided attention we give our pets. My home is a special place that’s cool for pets to stay, reducing stress and anxiety from alternative lodgings, giving you the freedom to enjoy your time away while I provide the loving care for your pets. As I strive to deliver a relaxed and stress free environment for your pets, it is important for you to feel reassured that your pets are in the best care and that you have the confidence in me, your pet sitter/walker. I hold a pet sitting diploma and a pet first aid certificate. Very importantly I am insured. In addition, I can use my experience of caring for my own pets as I understand how they form an integral part of the family. The feedback from pet owners have been how relaxed their pets are and grateful for the regular walks and company. Affordable rates, so please contact me to discuss and arrange a pre-visit as prices are tailored around your pet’s needs. I am a friendly professional, reliable and will always try to fit around your commitments. I live in Awsworth which offers easy access to rural areas. Awsworth village is conveniently located close to the motorway. This entry was posted by Richard Robinson on February 23, 2018 at 13:04, and is filed under Newsletter. Follow any responses to this post through RSS 2.0.Responses are currently closed, but you can trackback from your own site.